I was completely blown away by my visit to Edinburgh Sculpture Workshop. I had been a member for a couple of years in the early nineties when I first moved to Edinburgh. Living in a shared flat and not having a studio being a member of ESW enabled me to use workshops to produce a couple of pieces (now lost) that required a some ‘non-domestic’ processes. Next week I am meeting with Klas Hällerstrand who is a professional artist as well as having been recently employed by Enköping Council as a part-time Cultural Development Worker. We are going to be discussing ideas for establishing a studio complex here so my visit to ESW was always going to be more than a trip down memory lane however I was not expecting it to be quite so inspiring! 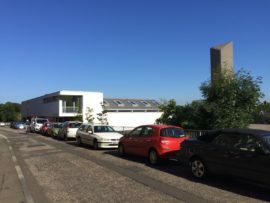 I had already seen on a-n’s Instagram account that ESW had moved to a purpose built space since my time in Edinburgh so I was a little prepared but as I walked along the road toward a subtly impressive and sensitive building I could not quite believe that I was in the right place. 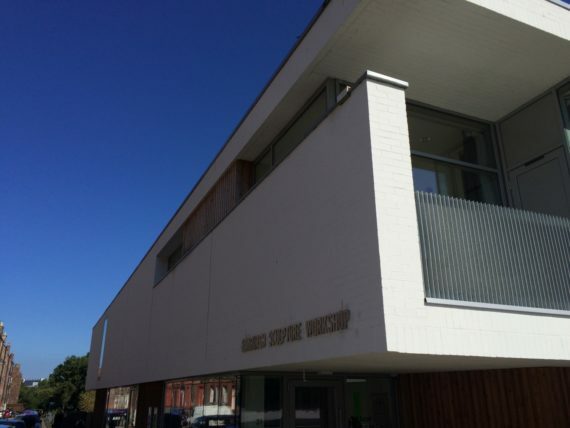 Certainly it helped that I visited on a perfect summer’s day – the clear blue sky and brilliant light emphasising the architectural simplicity and material beauty of the white painted brick, glass, and timber facade. Before inviting me to have a look around the building Chrissie Heughan (one of the studio holders) told me about the development of the new space as well as giving me an introduction to the three temporary exhibitions currently showing. It turned out that Chrissie and I narrowly missed our paths crossing in the mid-nineties when she ran workshops at the AIDS & HIV centre (in 1996) where I had been the arts administrator before leaving doing my MA in London (1995). 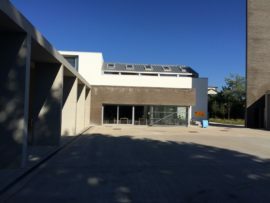 The twenty-six artists’ studios are on the ground floor (which due to the hillside location looks like the first floor from the backside of the building), along with the street-facing gallery, the research space, reception/office, kitchen and toilets. 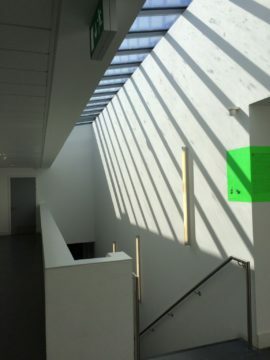 The studios have skylights and shallow windows just under the roof line which means optimum wall space and plenty of natural light (in the summer at least). 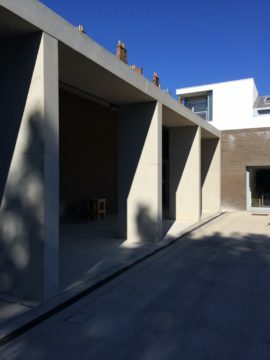 Although the studio doors are generous they are not so wide/high that truly monumental pieces could be made in an individual studio (nor do the internal corridors or fire-doors allow for it). On the first floor is a meeting room and (I think) further office space. 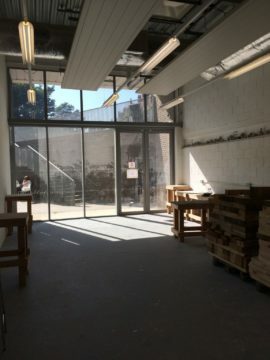 The workshops: wood, metal, and mixed media, are on the lower ground floor. 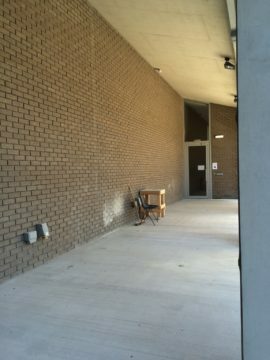 There is also an education room, project room, a large covered yard, the technicians’ office, and a store on this level. 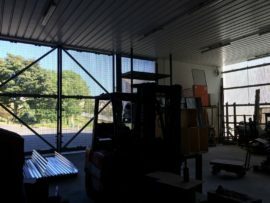 The yard has direct access to the car park through double height and very wide doors made of metal grill (the kind that I have seen used for flooring elsewhere), this is great for ventilation – I wonder how it is to work there in a Scottish winter (it would be unviable in a Swedish one). One corner of the workshop level leads to a self-contained cafe that is run as a separate enterprise. Obviously the artists/studio holders use their own kitchen too but it is great that there is a place on-site where they can get something to eat and invite visitors to lunch or afternoon tea. The surrounding area is predominantly residential with only a handful of ‘corner-shops’ and a traditional pub so I image that having a good modern cafe is a great asset when people come for studio visits as well as for the exhibition openings, workshops and courses, and other public events. 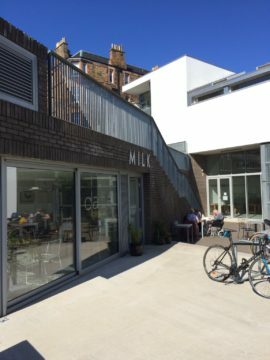 During my visit there were people taking advantage of the outside seating and cycle parking – there is a cycle path that runs along the backside of the site and the cafe and the second exhibition space are easily accessible from it. 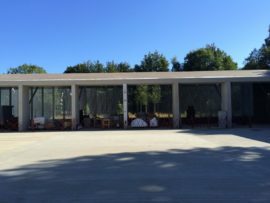 The exhibition space, which Peter – the assistant curator -explained also gets used for workshops, short projects, meetings, and even private/hire events, is on the opposite of the large courtyard to the cafe. 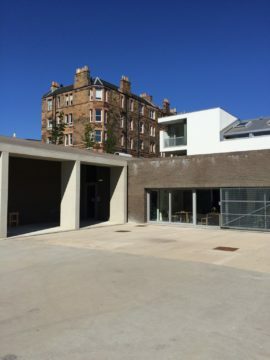 The two other sides are covered storage and working space, and a covered walkway that provides easy access to the exhibition space in even the heaviest Edinburgh downpour. 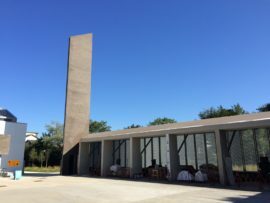 The architecture of the courtyard and the inclusion of a tower, that houses a permanent sound installation, lend the space a very ecclesiastic feeling – one could almost be at a modernist Swiss monastery! The management team and members have campaigned and worked hard since ESW was founded in 1986, these new ‘award winning’ premises are the culmination of many years (decades!) of consistent persistent effort to respond to artists’ needs and the ethos of accessibility and education. Chatting with Peter we discussed how having a well-designed building that provides a range of comfortable and appropriate working spaces as well as making it easy for visitors to feel welcome creates a professional environment that benefits everyone. I definitely got the sense that members and staff are (rightfully) proud of what they have achieved. 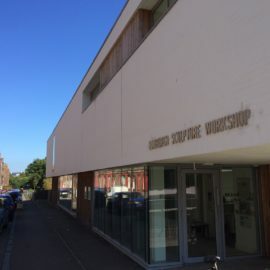 Irene, the ESW director, commented that interest in the workshops (and studios) is increasing, she has certainly noticed high demand for their programme of practical workshops and courses. 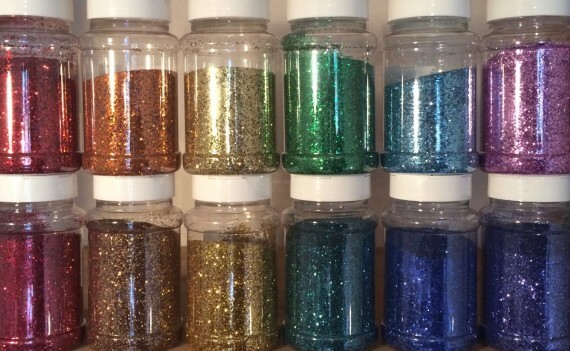 This is perhaps due to a renewed interest in materiality and form. Though the opportunity to work in such an inspiring building must surely contribute too. I left ESW feeling excited and with a head full of ideas to take to my meeting with Klas. We are long way from being able to replicate the facilities at ESW but I feel that we can aspire to create something equivalent and appropriate for Enköping. Reflecting on their history – from a grant of £398 in 1986 to identify artists’ need to a £2.3 millions Scottish Arts Council National Lottery Award in 2008 and the £3 million Arts Funding Prize for Edinburgh in 2010 – I begin to dream, I hope that I can gather together some like-minded passionately enthusiastic artists and supporters who are up for the challenge of making something fantastic happen here. With great thanks to Chrissie, Peter, and Irene at Edinburgh Sculpture Workshop. Flexible exhibition, education, workshop, and meeting spaces. Separate access. Technicians – look in to how this works!